It's so good to have you back! I'm so sorry I didn't realize you had been sick; I really hope you're all recovered now. I appreciate the visits and comments you left on my blog before Christmas, and I'm sorry I'm just now visiting here. Life has been very busy here since my dad passed away last August. I hope you have a good weekend, Bonnie. Our weather has been just like yours; it's been in the 70's here, too, but supposed to get quite cold again tomorrow night and Saturday. I have some pansy blooms about to open here. Bonnie, I have missed you immensely even though we have kept in touch via texts. 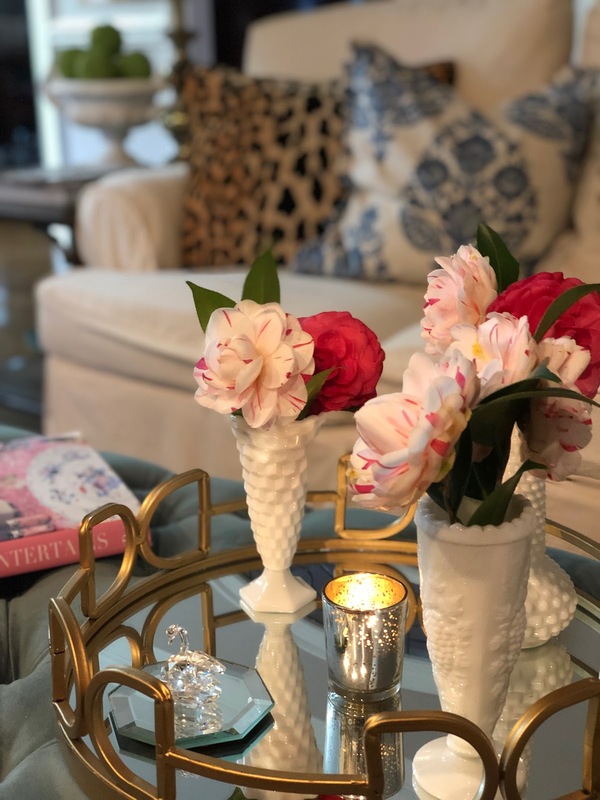 I missed your beautiful table on this week’s blog hop. I am glad you are feeling better. Your camellias are stunning, I think my favorite is La Peppermin!, they are all so pretty! I would have loved to have heard Bunny speak, I have all of her books. I do love the photo of you and your daughter, I know it will be framed! It reached 79 degrees yesterday and the highs are in the 40’s today, crazy weather. Take care of yourself my friend! 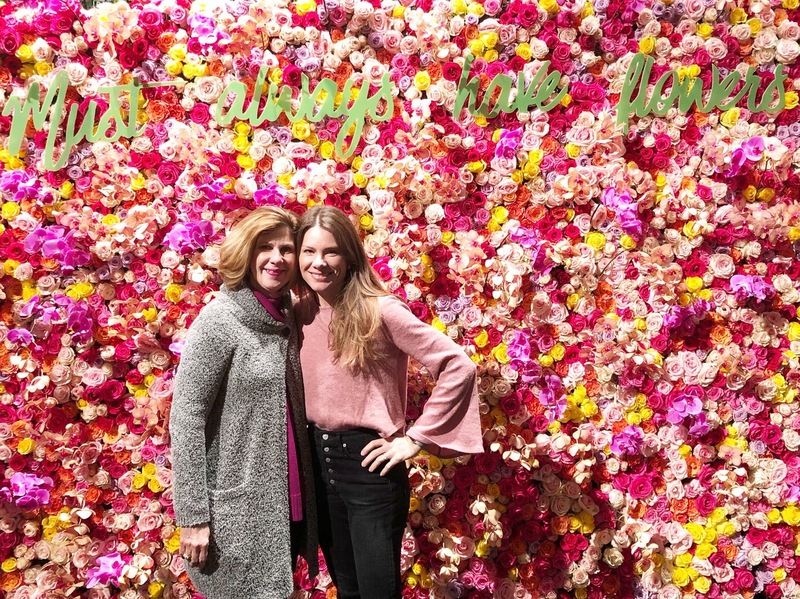 I'm so glad it feels like spring where you are -- that photo of you and your lovely daughter in front of that flower background set my heart in a tizzy, it was so beautiful. We're in the ice-and-snow mode still (and for awhile, I think) so seeing that flood of beautiful colors makes me smile very big this morning! 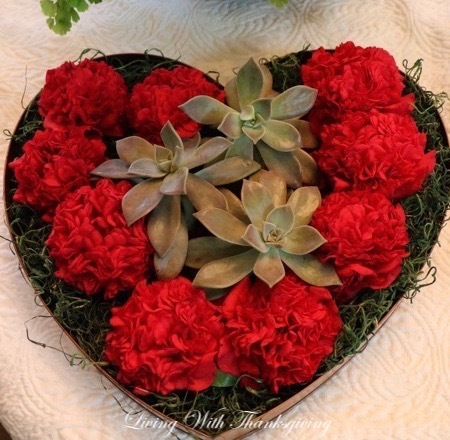 Every photo here is so lovely, the tablescapes, arrangements and your beautiful camellias. Oh, that Peppermint! I've never seen one like that and I'm sure I'd be an instant convert. Wonderful vignettes!Blessings and best wishes! Dear Bonnie, so glad you are feeling better. You have been missed. Oh, how I love your Camellias. They are certainly one of the things I miss from my Virginia garden. My favorite of yours is 'Professor Sargent.' It is gorgeous! Also enjoy seeing them in the milk glass bud vases, so pretty. The picture of you and your daughter is lovely. A beautiful post, Bonnie. Stay Well! Oh Bonnie, I'm so sorry to hear you've been sick! I thought you were perhaps busy or traveling... 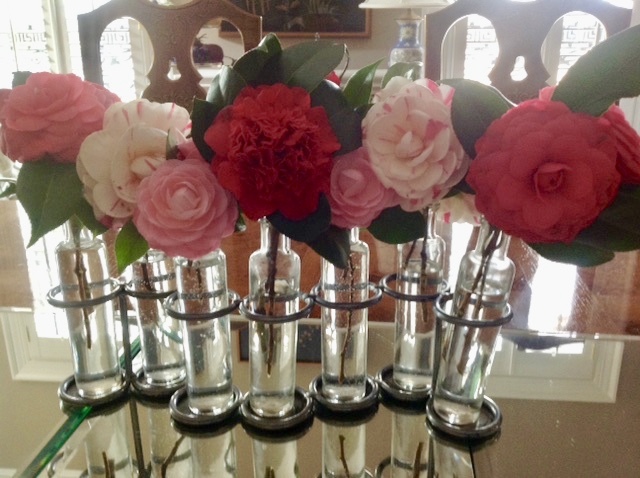 I am so sorry for the loss of your BIL and friend, with illness and the awful January weather we had I am sure you were very low...Your camellias are simply stunning, what a treasure to have right in your garden. I can't wait to see your new painting, and what a special time you and your daughter must have had at the gardens. So nice to hear from you! Welcome back! 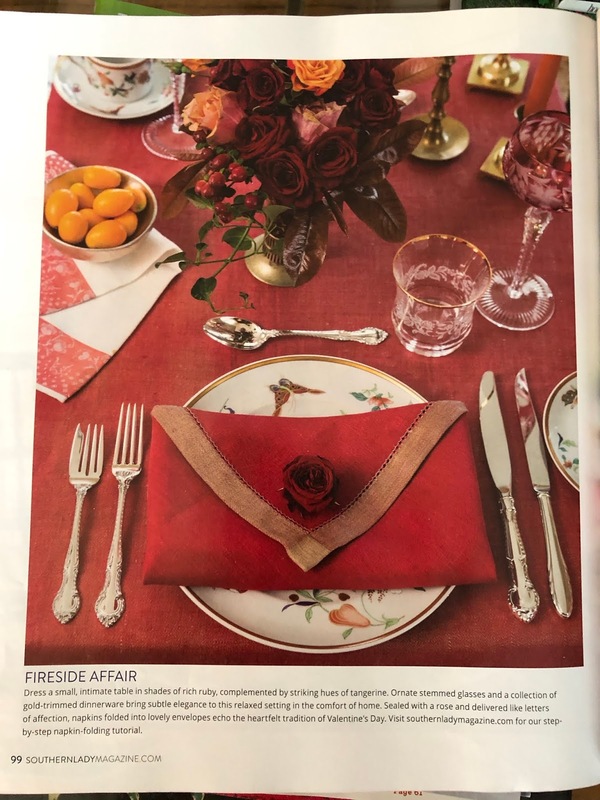 What beautiful table scapes. I love Valentine's, such a fun day. Sorry you have been under the weather and glad you are on the mend. Know you and your girl had fun in Nashville. Happy weekend! I am so sorry you've been ill. So happy to see a new post from you! Your camellias are so pretty! I love them. Ours have been blooming off and on all winter. We've been trying to find the Mine-No-Yuki to plant in our backyard, but we can't find them anywhere! Your camellias are beautiful. I absolutely love how you arranged them. I think that my favorite arrangement is the one with the milkglass. Awww, Bonnie, it's so good to hear from you. 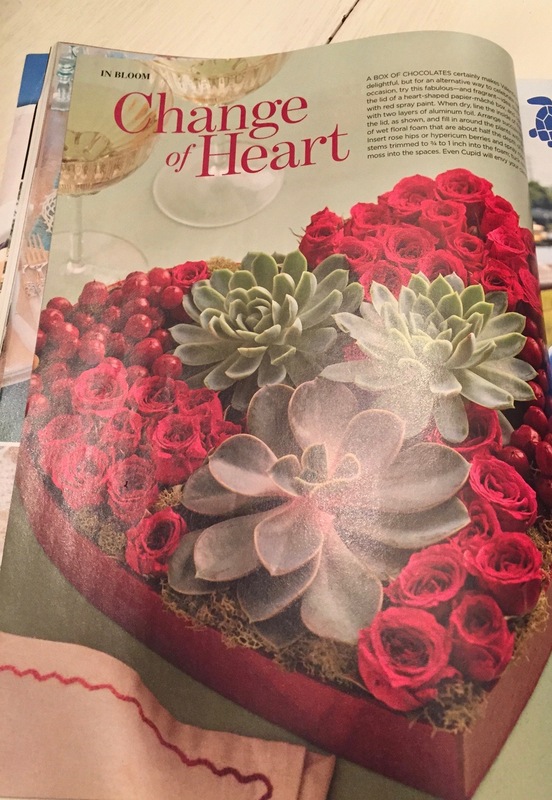 You were especially missed in the Valentine tablescape event. I knew there must've been a good reason. I sure hope you're regaining your strength and back to yourself. It sounds like the garden has been good therapy. These days where winter breaks toward spring (earlier for you in AL, but you are a good gauge for those of us further north) are a welcome sight! Your camellias are outstanding. I would love seeing them in the garden. Your daughter so resembles you, and I'm happy you two could share that time bonding over a common interest. Wonderful bonding experiences when our adult kids can enjoy some of the things we grow to love so much as we turn our houses into homes. I am glad you are back! Your camellias are beautiful! We missed your table in the last hop, I sent you an email tonight! Thanks for popping back in at Celebrate Your Story!! Bonnie, I have been thinking of you. I am so sorry that you have been ill and to hear of the loss of your dear loved ones. I will keep you in my thoughts and prayers. Those camellias are beautiful, and the perfect thing to brighten a winter's day! Take care, sweet friend. I hope you have a Happy Valentine's Day!!! Hope you are feeling much better now Bonnie, no fun being under the weather. And, for your loss. Just wanted to say I say where you won the giveaway at Purple Chocolate Home and wanted to say congrats. I know you will enjoy using the MC pie plate. Happy Valentine' Day dear Bonnie........thinking of you! New to your blog. Congratulations on you win of the beautiful MC pie plate. I look forward to pursuing through you beautiful posts. I'm so sorry to hear you've been having such a difficult time, Bonnie. A big, strong hug. Bonnie, I hope you are all better by now, or close to it. It's been a touch year for the flu and colds. My husband is never sick, and he's been coughing for over 5 weeks now. What a treat to go to the Nashville Antique Show! I wish we could have made it to see the antiques, and my friends Eric and Ruthann Ross. I love Bunny! Isn't she so charming, she is not only talented, but very easy to talk to, also. The kind of woman you could be best friends with! I am so sorry about your losses, it's always so difficult, I know you will miss both terribly. I hope that over time the sweet memories you have will warm your heart each time you think of them. I am so very sorry about the loss of your brother-in-law and your dear friend. No wonder you have been sick for so long, but I'm happy that you're feeling better. How nice for you and your daughter to hear Bunny Williams. The picture of the both of you is so cute and fun. Your Valentine list from last year, by the fire, is such a romantic one. Take care, Bonnie, and I hope you have a good week. P. S. Your camellias are outstanding!